Daily time spent in front of digital screens–cell phones, tablets, and computers–has become a hallmark of our connected society. A greater amount of neck, back, shoulder and arm pain have developed due to this increase in screen time. Data shows that 95% of American adults have access to a cell phone with 77% using a smartphone. In addition, tablet computer use has almost doubled (42%) in five years 1,2. What’s causing the pain? Tablets, smartphones, and to some extent laptops, generally have screens that are linked to a keyboard. This setup can produce greater neck flexion angles–bending of the neck toward the chin–because the eyes have to look down to see the screen and keyboard. 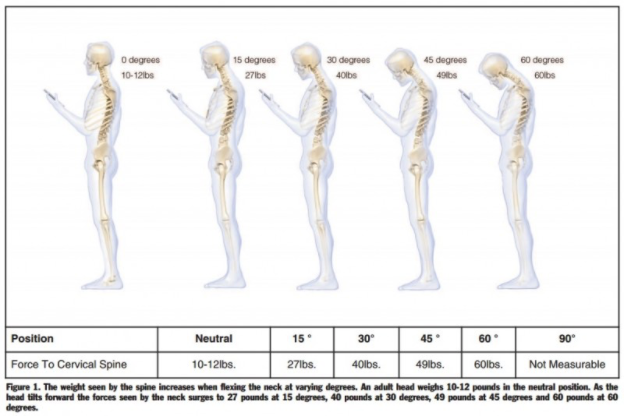 The neck flexion position associated with texting has a correlation with increased pain in the neck, upper back and numbness in the fingers 3. The amount of time spent texting and the number of text messages sent played a role in developing these upper extremity pain symptoms. 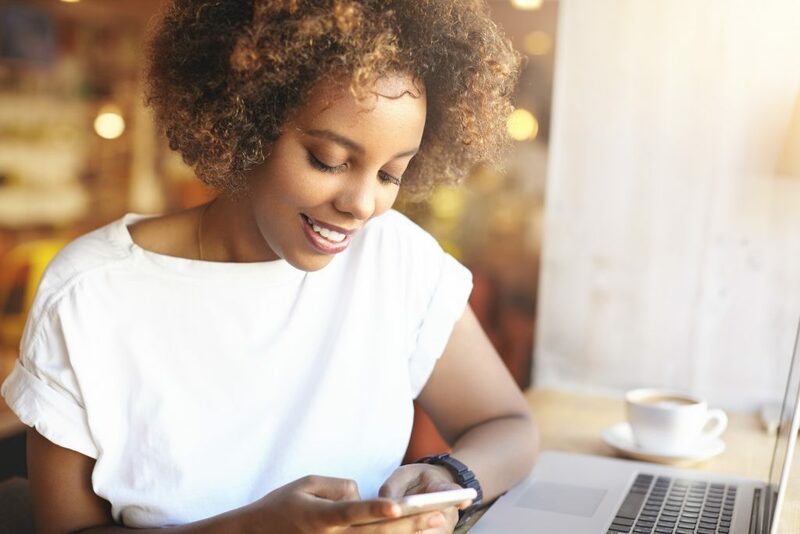 Women who texted more than 20 times per day and men who texted more than 6 times per day were more likely to develop neck, arm, and finger pain. The velocity at which women text was shown to be greater than men which may account for why women sent more texts prior to developing pain. The study suggests that greater amounts of time in the neck flexed position may increase pain in the upper extremities 3,4. In other words, the more time spent looking down at a phone or screen may be the cause of your increased pain in the neck and arms. There has also been a correlation between lower back pain and spending more than one hour at a computer in high school students 5. An additional study on sedentary lifestyle found that people who watched TV for more than 60 minutes were found to have a greater likelihood of developing chronic pain 6. Sitting has recently been deemed the new smoking as recent studies show a direct relationship between time spent sitting and all-cause mortality 7. As it stands today people sit for 50-75% of their waking day 8. Generally, understanding how to move throughout your day is likely the best solution to reducing postural discomfort from using phones, computers, and TV. Whatever type of screen you find yourself looking at for work or home life, it’s a good idea to take breaks with some type of movement every 45 minutes. There has been evidence to support workday breaks which include active movement and postural change for reducing back pain 9. Have a trigger to remind you to stand up, for example, when you take phone calls. Changes in posture can be as simple as moving from a seated to a standing position, walking to get water or performing neck and arm stretches. Stretching and strengthening techniques are key to maintaining a strong spine and limbs to counteract the body positions that are causing you discomfort. We can teach you one-on-one or in a group session how to prevent pain in your bones, muscles, and tissues. Learn how to move your body during stretch breaks or how to safely increase your physical activity to improve your quality of life. At work, your manager may even thank you, as active movements are proven to have positive effects on work productivity too! Brad MacDougall is a Doctorate of Physical Therapy and Board Certified in orthopedics. He takes pride in building strong relationships with his patients and strives to develop goal-oriented therapy treatment plans that allow them to return to the activities they enjoy. Brad is a certified TRX Sports Medicine provider and utilizes this as a strength training and stretching tool in his sessions. His free time is spent with his wife and two children and he enjoys running and basketball. Ryne Fiebig holds a Doctorate of Chiropractic and in the interest of providing the best possible care to his patients, he has completed upper extremity, lower extremity, and spine certifications in Active Release Techniques (ART). Additionally, he has certifications in FMS (Functional Movement Screening), RockTape, and IASTM techniques. Ryne has a passion for skateboarding, snowboarding, and other extreme sports, including completing his first Spartan Trifecta. 4 Y. Xie, G. Szeto, J. Dai. Prevalence and risk factors associated with musculoskeletal complaints among users of mobile handheld devices: a systematic review. Appl Ergon. 2017;59:132-142. 8 Marc T. Hamilton et al. Sedentary behavior as a mediator of type 2 diabetes. Med Sport Sci. 2014; 60: 11–26. 9 Waongenngarm, P. et al. The effects of breaks on low back pain, discomfort, and work productivity in office workers: A systematic review of randomized and non-randomized controlled trials. Appl Ergon. 2018;68:230-239.